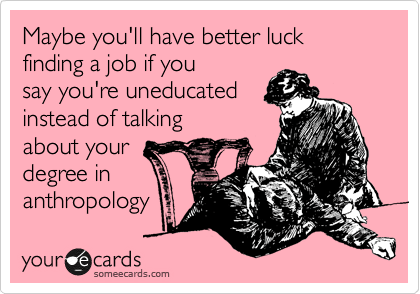 An anthropologist is the ultimate people person… no, literally. Not to be confused with paleontology (those are the folks that dig up dinosaur bones), anthropologists study all things related to the human condition. That can include archeology, where you’ll uncover old civilizations; physical anthropology, where you’ll look how humans’ traits have evolved over the centuries; cultural anthropology, where you’ll study the differences between different groups of people both in the past and in the present, and make cross-cultural comparisons; and forensic anthropology, where you’ll look at skeletal remains to see how people lived… and died. Contrary to what your childhood made you believe, anthropologists don’t save ancient artifacts from Nazis. Indiana Jones is what anthropologists like to call a “looter” and it’s frowned upon in most circles. In reality, you’ll be doing a lot of reading. Before you can dig into your fieldwork, you need to get your facts straight, so this might not be the major for you if you’re allergic to textbooks. You better love taking precise measurements, because you’ll be spending a lot of time in a lab. However, if you’re a perfectionist who loves both the humanities and the sciences and can’t decide between the two, anthropology is no-second-thought-Tinder-swipe-right kind of match. This requires schooling through the PhD level, but it can be particularly rewarding if you want to stay in academia and do your own research. The job market in this field is fierce; tenure track positions are disappearing in every field, and anthropology is no exception. However, if you’re really passionate about teaching and encouraging more young students to join the field, this is perfect for you. In addition to teaching, you will also be expected to do your own research. Grant writing is a must, as you’ll constantly need to petition several organizations for funding. However, if you play your cards right, you could be taking regular sabbaticals to do field work. Three months studying indigenous tribes in South America? Sign me up. If academia isn’t your place, your experience as an anthropologist means you have a unique understanding of ethics and cultural relativism—in other words, you’re cool with the fact that not everyone thinks like you. Consider going to law school after your undergrad degree if this sounds right to you. Amal Clooney is a human rights lawyer, and life isn’t so bad for her. If you’re a tough negotiator and have a passion for preserving history, this is your dream job. It combines all those skills of buying and selling you’ll learn in a business class with the perfectionistic tendencies of a well-prepared researcher. Most curators specialize in an area, so if this is a career aspiration for you, try to get experience in several different historical periods so you know which one is your favorite. Those interested in cultural anthropology and advocacy might be particularly attracted to this field. It’s very broad, but basically includes any work that tries to address issues in developing countries while still protecting that culture. It’s tough work, and people in international development have to get knee-deep in a culture to make sure they’re really helping people rather than forcing values on them. Think of it like the work you’d do in the Peace Corps. In fact, joining the Peace Corps would be an invaluable first step if you see this a potential career option for you. If you’ve always wanted to work in a CSI lab, this might be your calling. 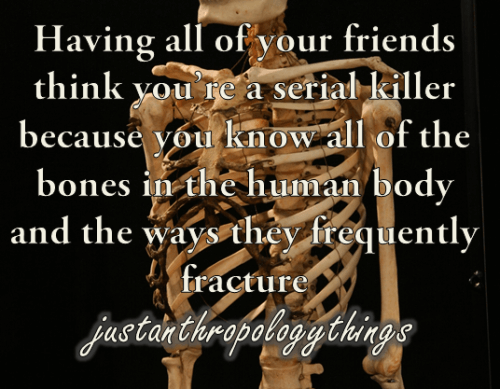 Forensic anthropologists work in crime labs from the federal all the way down to the state level. They’re often used to solve crimes, and are particularly important in high profile cases where the cause of death of a victim needs to be determined. In addition to working in a lab, you’ll be dealing with court dates and depositions, so it requires a lot of legal preparation as well as hands-on work. It’s morbid, but sure to be a great icebreaker at cocktail parties. If you’re serious about being an anthropology major, consider checking out the American Anthropological Association’s website for career profiles and more exciting information about this awesome field.